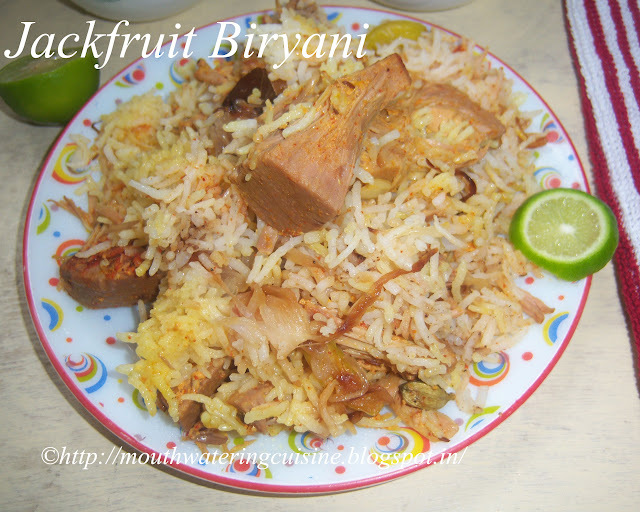 Jackfruit biryani is an exotic recipe with amazing taste and aroma. It is made with tender jackfruit. Tender jackfruit is used for preparing curries and biryani and ripe jackfruit is consumed as fruit. I have already posted curry recipe with tender jackfruit. I cannot say it is easy to make but not very difficult though. This biryani is made like normal biryani only. But, we have to plan ahead and prepare well in advance, then making it becomes very easy. Soak basmati rice for one hour. Cut jackfruit into big pieces. Add salt and turmeric powder. Pressure cook it for three whistles. Add curd, split green chillies, salt, red chilli powder, coriander powder and juice of one lemon to it. Marinate it for 1 to 2 hours. Chop onions and fry them till caramelized. Add saffron to luke warm milk and keep it aside. Boil 3 cups of water in a thick bottomed vessel, add rice, salt and oil in it. Cook it till half to 80 percent done. Heat oil or ghee in a thick bottomed vessel. Add shahi jeera, cloves, cinnamon stick, cardamom and bay leaves. When they start spluttering add ginger garlic paste. Fry them. Add marinated jackfruit pieces and spread them. Cook for 5 mins on high flame. Now simmer the flame and spread rice over it. Spread a layer of caramelized onions over the rice. Add saffron milk to it. Now add another layer of jackfruit pieces, rice and onions. Add saffron milk and little salt, red chilli powder and garama masala. On another burner, heat iron tawa. Shift the biryani vessel on to it. Allow this to on low flame cook for another 15 to 20 mins. 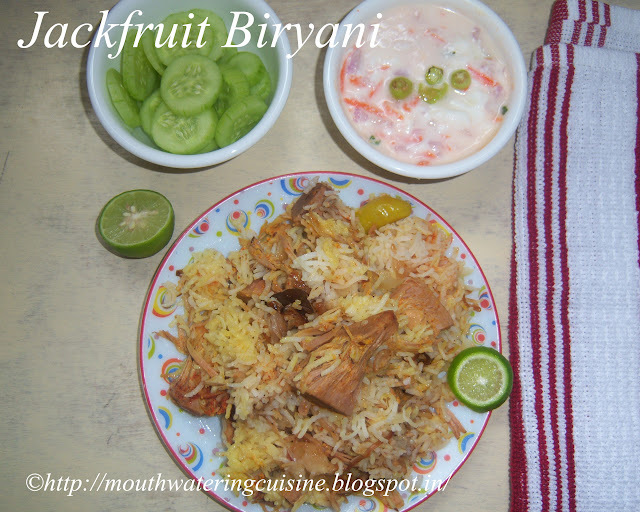 Serve hot jackfruit biryani with onion raita. For more rice recipes click here. Thank you for visiting my blog. Hope you all like my recipes. Any feedback and comments are appreciated.